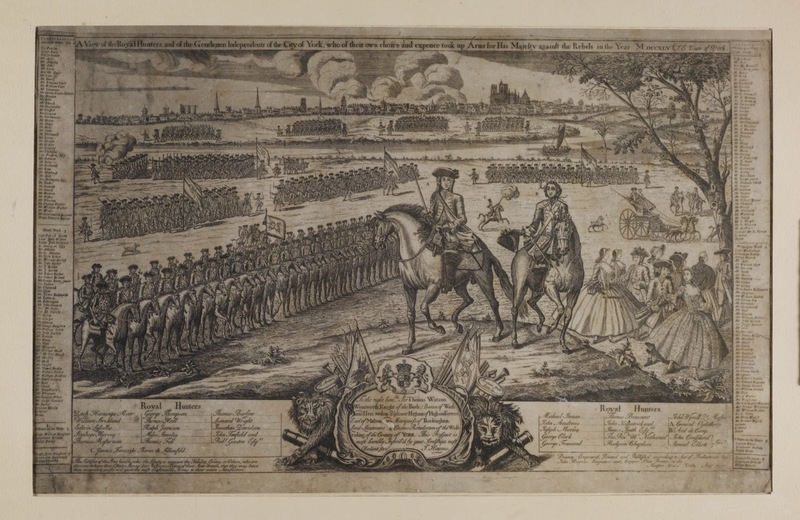 During the Jacobite invasion of England in 1745, many loyal Whigs (supporters of George II) raised regiments of troops to aid their king against his competitor, Bonnie Prince Charlie. 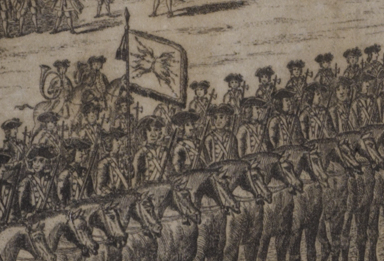 On 24 September 1745, several Whig gentlemen of Yorkshire decided to raise a unit to aid George II. Their contribution included both a regiment of foot called the Yorkshire Blues, and a regiment of cavalry called the Yorkshire Hunters. I detailed the flag of the Yorkshire Blues in a previous post (see http://defendingthelegacy.blogspot.com/2017/01/flag-of-yorkshire-blues-regiment-in-1745.html) and am now recreating the flag of the Yorkshire Hunters. 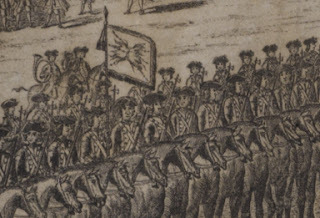 A unique eyewitness engraving shows the Yorkshire Blues and Hunters on parade, with glorious detail of their colours. I am focusing here on the Hunters' colours. In the engraving, they are carried by the squadron (see the detail picture at right). While this view is leaves most of the details unknown. 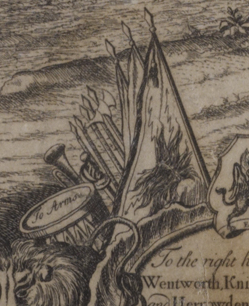 the artist included a "close-up" of the flag's details in a cartouche near the bottom of the picture. 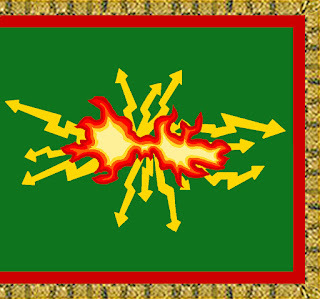 The center of the flag is occupied by a burst of flames with thunderbolts emanating from it. This device was also used in the flag of the French Compagnies Franches de la Marine. (1) I do not know what connection, if any, this device has to Yorkshire or its nobility. Nevertheless, this is certainly what is depicted in the engraving. Since the engraving is in black and white, some artistic license had to be used to render the flag into color. 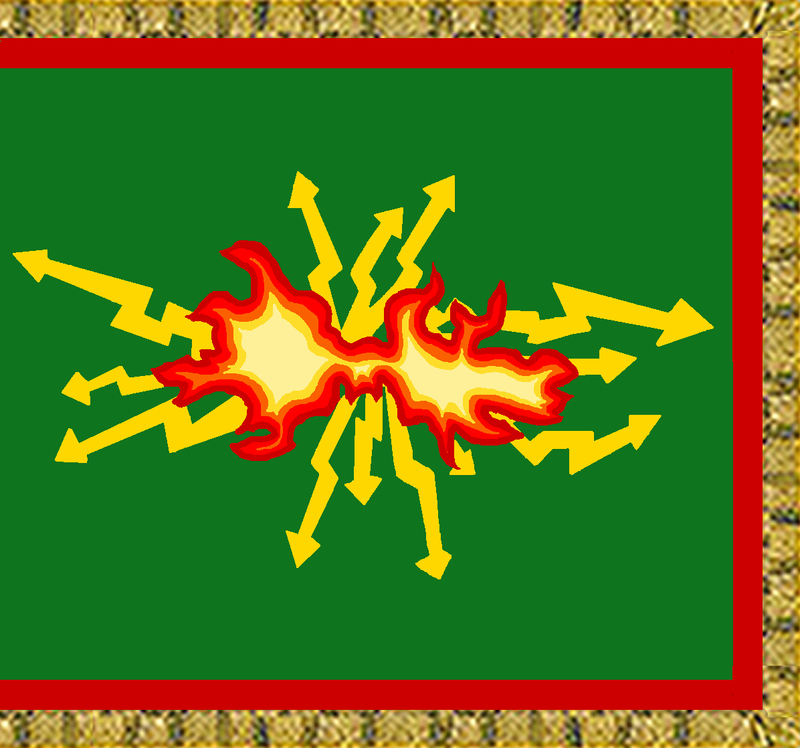 The flames and thunderbolts are depicted in their natural colors, following the Compagnies Franches de la Marine flag. However, the ground and border of the flag was more difficult. I chose green for the ground and red for the border, with golden fringes. Why? Finally, I would like to thank everyone who commented on my previous Yorkshire Blues flag. All your comments encouraged me and I fully intend to continue creating Jacobite flags from contemporary illustrations or existent relics. Stay tuned! If you are a wargamer and would like to deploy a Yorkshire Hunters flag in your armies, go ahead; however, an attribution to the artist would be appreciated :). (2) Reid, Stuart, Cumberland's Culloden Army 1745-46. Oxford: Osprey, 2012. pg. 46. Looks excellent, if only the Generals of these units and other kept detailed diagrams of their flags?